Abstract: The system when installed with a CPU and hard drive is perfect as a home theatre, or bookshelf PC. These days computers cannot be just fast and powerful, they also have to be small and packed full of features. The MSI Hermes Barebones system is not quite as small as some of the other SFF systems out there, but it's certainly slimmer than regular mid tower computers. The system when installed with a CPU and hard drive is perfect as a home theatre, or bookshelf PC. The Hermes is powerful enough for everyday computing as well. We're going to be taking the MSI Hermes for a spin today and be giving you our $0.02. The barebones Hermes is based around the SiS 650 chipset and that means it supports Socket 478/400 MHz FSB Celeron/Pentium 4 processors. The SiS 650 chipset does not support the newly released 800MHz FSB Pentium 4 processors. As you may have guessed, because this is a Small Form Factor (SFF) PC, everything is integrated, integrated, integrated! On board goodies include analog video as well as DVI so you can connect a CRT or LCD monitor up easily, TV and S-Video outputs, 5.1 audio, 10/100 LAN for networking, a MS memory card reader, USB 2.0 and IEEE 1394. If you need to add onto that, there are two horizontal 32-bit PCI slots off of a riser card which will support most devices as long as they are not too large. Round front there are two PCMCIA slots which can come in handy for devices like WLAN adaptors. Lastly the two DIMM's support up to 2GB of PC1600/2100 DDR. After using the Hermes for a while it is easy to see the unit has been designed with the end user in mind. There are four USB 2.0 ports on the front behind a small flap as well as an IEEE 1394 Firewire jack - great for plugging in a digital video camera. There is also an SPDIF output as well as microphone and headphone jacks under the same flap. 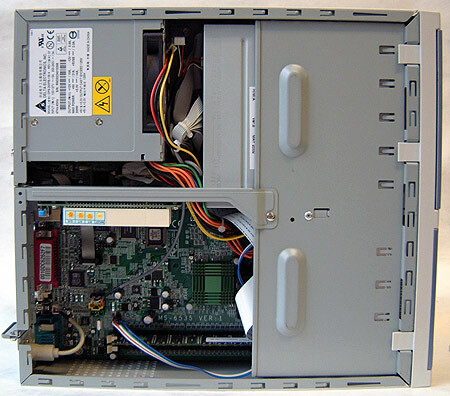 The two PCMCIA slots are located on the front of the computer which is very handy when installing and removing devices. MSI included a slim line notebook style floppy drive with the system as well. As you can see, with the accompanying stand the Hermes can also operate vertically as well. While the Hermes is not as "cool looking" as the MSI Metis 266 we reviewed earlier, I can easily say I like the layout of the Hermes a lot more. While the face of the Hermes may look a bit intimidating and complicated, it's actually very easy to use and well organized. Under the flap on the bottom left hand corner of the bezel lay the SPDIF, headphone, microphone, USB ports and IEEE 1394, if you're not using it, just close the flap. If you do not plan to use the PCMCIA slots they can also be hidden. The way the case comes in contact with the CD-ROM drive is clumsy, and is in fact one of the few down sides to the entire unit. With a Samsung 40x12x40 CD-RW drive installed for testing, the eject button on the front bezel was not able to reach the eject button on the drive. We had to move the CD-RW about 5 mm farther out for contact between the buttons. It would have been simpler to have the face of the actual CDROM showing instead of trying to pull off an 'IMac'. The innards of the computer while cramped are well designed. The processor is located near the front of the case where air is exhausted after cooling the other components in the case. The computer is powered by a relatively small 200W Delta ATX PSU, but since there is no AGP socket, and no room for additional hard drives I don't think this will be a problem ever. There are a total of two molex connectors as well as one floppy power connector.